Every February, as part of the illustrious Glasgow Film Festival, horror fans and movie-goers from all over the UK converge on the Glasgow Film Theatre (GFT) to enjoy two full days of non-stop, back to back horror films – an event known as Fright Fest! The Glasgow Fright Fest is one of the highlights of the festival. We here at James vs. Burger are huge film fans and always attend the festival every year. Fright Fest is a great experience; however, being in the cinema for two full days can be a little too much, even for the most hardened film buff. During the afternoon break, we take the oppertunity to grab a burger from a nearby bar or restaurant and feel that it’s without a doubt the best way to re-charge the batteries before the second half of the event. Since many people will be arriving in Glasgow just for the festival, we thought we’d put together a list of three burger joints that are all within close walking distance (five minutes or less) of the GFT that you should go out of your way to check out during the festival. 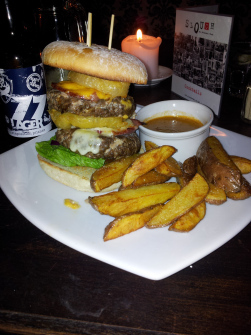 In our opinion, Nice N Sleazy offers up the most creative burgers in Glasgow. The menu has been carefully designed by Chef Andy Yates of ‘MeatHammer LTD‘ and his burger creations are much talked about among foodies in Glasgow. Andy is a huge fan of horror films too! One of his most recent creations, the ‘Lucretia burger’ comes topped with chorizo, spicy pulled pork, tomato, burnt pineapple, chilli jam and hot buffalo sauce all on top of a juicy handmade burger and all inside of a handmade bun. It was also the burger that won Andy and MeatHammer the votes of many of our readers to crown them the home of the best burger in Glasgow in 2012. The best part? This monster will only cost you £7.25. 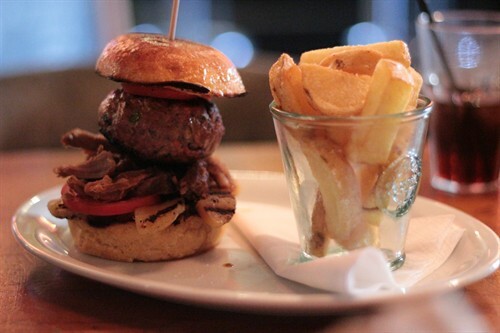 We’ve received a lot of positive feedback on Cocktail & Burger via our Twitter and Facebook pages with a lot of people commenting on the burgers being a perfect size – not small, but not so big that it’s impossible to eat. C&B are clearly listening to their customers, recently describing their food on Twitter as ‘burgers that you can eat on a date without looking silly’. 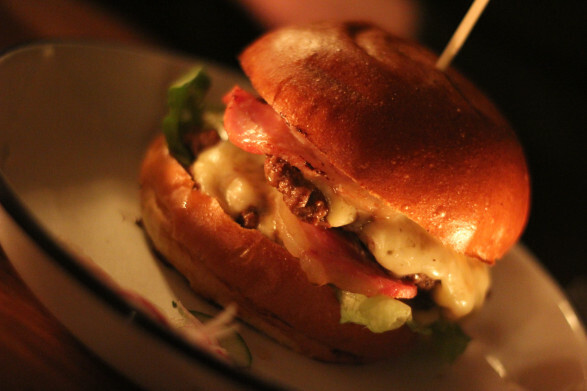 Since opening, Cocktail & Burger has exploded in popularity and has quickly established itself as one of Glasgow’s best burger joints. The patties here are the handmade, thin, smashed-style that you’d find at the likes of Shake Shack or Five Guys Burger in New York City and the burgers are always on a 2-4-1 offer. It can get very busy, but is worth the wait. We’d recommend a C&B burger (ask for extra secret sauce on top) with a side of steal fries, mussel popcorn and a pint of house lager. Tasty! If you fancy getting off of Sauchiehall street and heading a little further afield, we wouldn’t recommend going any further than Bath street since the main festival break only usually lasts for one hour. If you do head to Bath street, check out Slouch, which offers a wide range of burgers, the star of which is their gargantuan ‘Greedy B’. Slouch’s atmosphere is laid back and you’ll always find a fantastic selection of music being belted from the speakers. When we reviewed their burgers, our only real complaint was regarding the bun, which we felt was a little poor. We’ve received several reports from our readers since then; however, informing us that they have replaced the old floured bun with something better. If you stop by, tuck into a Greedy B and an ice cold bottle of Brew Dog or Blue Moon beer – just don’t eat anything else before hand! If you are attending the festival this weekend, be sure to send us your photos and reviews, no matter where you decide to go for a burger. Glasgow is home to some of the best burgers in the UK and we could continue to provide a list of recommendations as long as the queue outside the GFT this coming weekend; however, the options above can be quickly reached on-foot from the cinema and should allow anyone plenty of time to make it back on time for the next movie. Enjoy the festival and your burgers! We’ll see you there!